IQ's Corner: Research Byte: Short-term memory for faces is related to general intelligence: A possible new CHC narrow ability taxonomy candidate? Research Byte: Short-term memory for faces is related to general intelligence: A possible new CHC narrow ability taxonomy candidate? Short-term memory for faces correlated positively with several stratum II factors. Short-term memory for faces was associated with general intelligence at .34. Short-term memory for faces should not be considered “special” (i.e., independent of g). Prosopagnosia may be best characterised as a learning disability. The results associated with a small number of investigations suggest that individual differences in memory for faces, as measured by the Cambridge Face Memory Test (CFMT), are independent of intelligence. Consequently, memory for faces has been suggested to be a special construct, unlike other cognitive abilities. However, previous investigations have measured intelligence with only one or two subtests. Additionally, the sample sizes upon which previous investigations were based were relatively small (N = 45 to 80). Consequently, in this investigation, a battery of eight cognitive ability tests and the CFMT were administered to a relatively large number of participants (N = 211). Based on a correlated-factor model, memory for faces was found to be correlated positively with fluid intelligence (.29), short-term memory (.23) and lexical knowledge ability (.19). 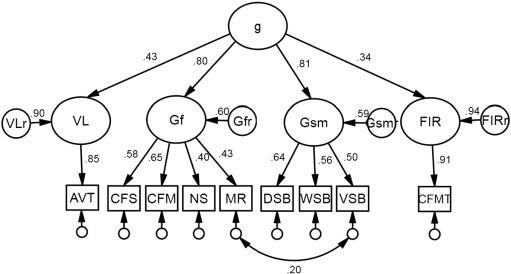 Additionally, based on a higher-order model, memory for faces was found to be associated with g at .34. The results are interpreted to suggest that memory for faces, as measured by the CFMT, may be characterised as a relatively typical narrow cognitive ability within the Cattell–Horn–Carroll (CHC) model of intelligence, rather than a special ability (i.e., independent of other abilities). Future research with a greater diversity in the measurement of face recognition ability is encouraged (e.g., long-term memory), as the CFMT is a measure of short-term face memory ability.